Denver, CO (April 4, 2019) – Sunflower Bank, N.A. is pleased to announce three recently closed and funded asset based lending transactions that provided credit facilities to lower middle market companies, one in partnership with a private equity investment. Sunflower Bank’s Structured Finance Group launched in June 2018 bringing together a team of experienced industry leaders to provide corporate finance services to clients and prospects with borrowing needs of $3.0 MM to $15 MM+. 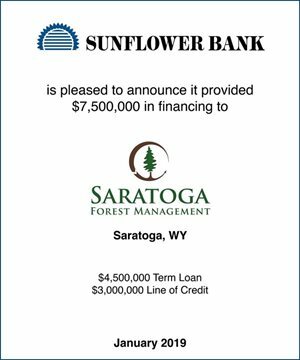 In January 2019, Sunflower Bank closed $7,500,000 in financing for Saratoga Investments, LLC dba Saratoga Forest Management. The financing facility consists of a $3,000,000 working capital revolving line of credit and a $4,500,000 machinery and equipment term loan. Saratoga Forest Management, located in Saratoga, WY, runs a high altitude framing lumber sawmill that has been in operation since the 1940s. 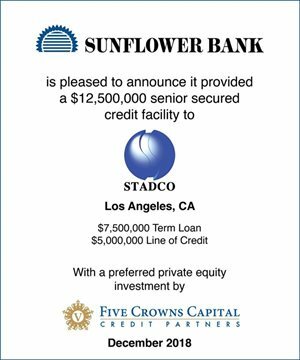 Sunflower Bank, in collaboration with Five Crowns Credit Partners, delivered $13,350,000 in financing to Stadco, Inc. in a transaction that closed in December 2018. It consists of a $12,500,000 senior secured facility ($5,000,000 asset based revolving line of credit and a $7,500,000 machinery and equipment term loan) from Sunflower Bank and $850,000 of preferred equity from Five Crowns Credit Partners. Five Crowns Credit Partners provides flexible debt and equity funding to lower middle market businesses. Stadco is a manufacturer of high-precision components and tooling for the commercial aerospace, defense, space, and industrial markets headquartered in Los Angeles, CA. The facility will be used for working capital purposes. 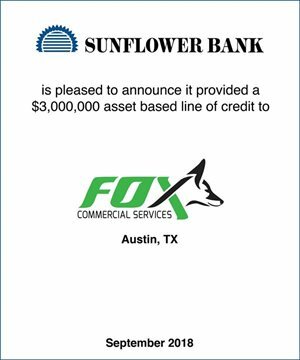 A $3,000,000 working capital, asset based line of credit from Sunflower Bank for FCS Fox Commercial Services, LLC closed in September 2018. FCS Fox Commercial Services is headquartered in Austin, TX and operates out of the Austin and San Antonio metros and surrounding areas. FCS Fox Commercial provides commercial HVAC, electrical, plumbing and refrigeration services. “We’re pleased to announce these transactions that represent the breadth of asset based lending service and expertise that Sunflower Bank can provide. Our Structured Finance Group has broad experience across multiple industries and with a variety of financing needs,” said Dustin Jacobson, Managing Director of Asset Based Lending at Sunflower Bank. The Denver-based Sunflower Bank Structured Finance Group structures asset based lending and leveraged finance capital solutions for lower middle market companies and private equity investors. For information, visit SunflowerBank.com/StructuredFinance. Dustin Jacobson can be reached at 303.468.0483 or Dustin.Jacobson@SunflowerBank.com.